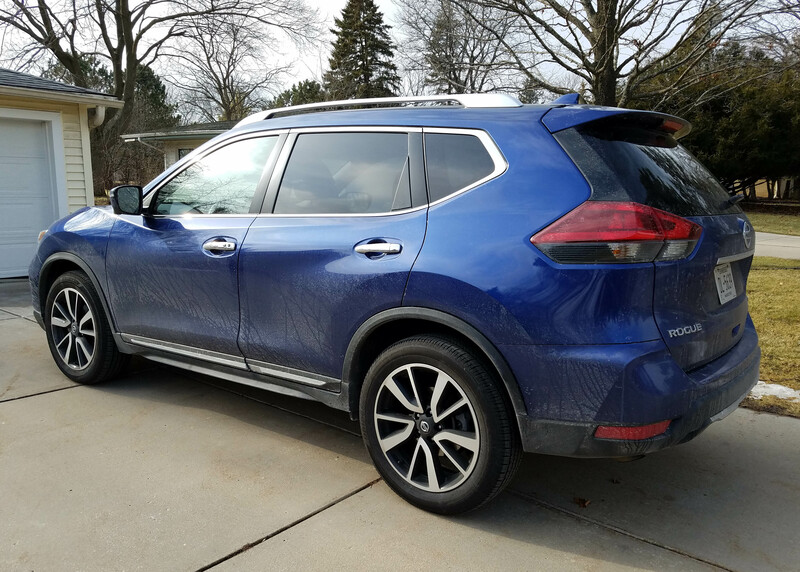 What it has going for it in the small sport-utility/crossover market is that it’s not too small. It has good interior space for four adults and generous cargo room behind the rear seat. It’s comfortable, has supportive seats and is priced competitively. Last year its styling was updated and Rogue remains a handsome SUV. But it has its limitations. Some of its competitors perform better, for instance the Subaru Outback, which is of similar size. Both have AWD to make them appealing in our sometimes snowy climate, and all the utes in this class offer that feature. While the Rogue’s interior is comfy and refined, the cabin relatively quiet and all, I found the ute’s main driving characteristics solidly middle of the road. Nothing stood out. For instance Rogue’s power is modest with its 2.5-liter I4 kicking out 170 horsepower. Mated with a smooth, but uninspiring automatic CVT (Continuously Variable Transmission), its acceleration is mild. Rogue doesn’t feel terribly heavy, which is good, but if you want or need quick acceleration you won’t find it here. In fact, if you press the accelerator to the floor demanding more power you’ll get some, but the engine noise grows substantially, the growl often disturbing to riders. Rogue sounds like it’s working hard to get up to highway speeds if you tromp it. 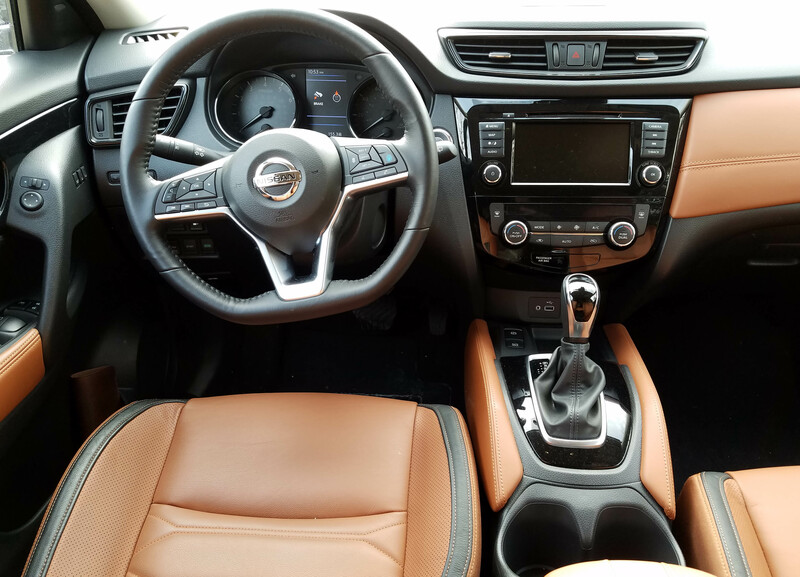 There is a Sport mode button that once engaged will give the Nissan more torque, but again, engine noise becomes an issue. Several of its competitors aren’t endowed with a lot of pony power either, but they don’t seem so coarse during hard acceleration. I was surprised by the ride too. 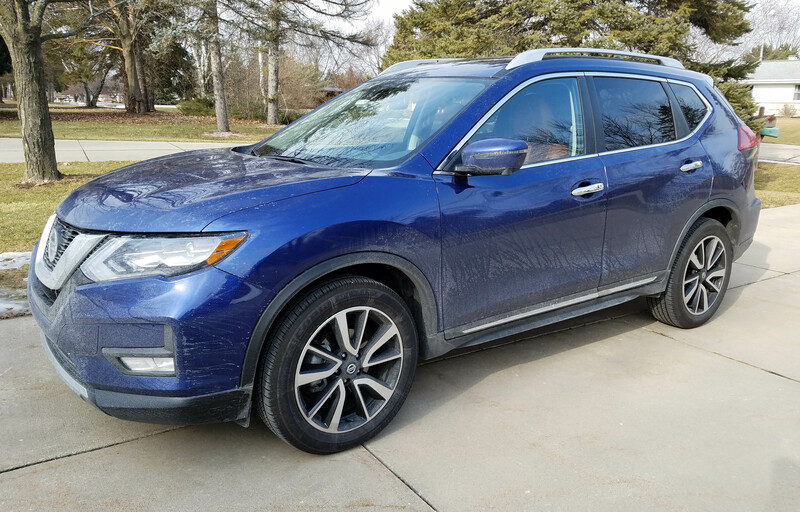 I’ve enjoyed past Rogue’s ride, but this one felt bumpy and sharp over major road imperfections, of which we have many in Southeast Wisconsin. Even on the highway the jiggle inside was noticeable. Naturally it was cold during my winter test drive, but my previous drive had been in winter too. Rogue has what should be a sufficient wheelbase at 106.5 inches to smooth the ride and independent suspension up front and multi-link in back. Likewise, the steering is rather blah, meaning there’s more play in the wheel than I’d expected. Other competitors are generally more responsive. Nissan includes a blind-spot warning system on even the base S model, plus cross-traffic alert. That’s a bonus, and the tested top-level SL with all-wheel-drive, includes virtually all the safety equipment you’d want or expect. That includes an Around View (360-degree) camera that can help as you back into or out of a parking spot. Nissan’s ProPilot Assist system also came on the dark metallic blue test ute. This is part of the Platinum package that includes 19-inch alloy wheels and an electronic parking brake. ProPilot is a semi-autonomous driving system that works in conjunction with cruise control and lane departure. When engaged it makes small corrections to your steering to keep the Rogue centered in its lane. It does the same when rounding curves so long as the system can see both the center and side lane markings. I used this on the highway and it was fine, but you must get used to the wheel twitching some in your hands as it corrects your steering. You cannot let go for more than a few seconds or the system senses that and alerts you to take control of the wheel. 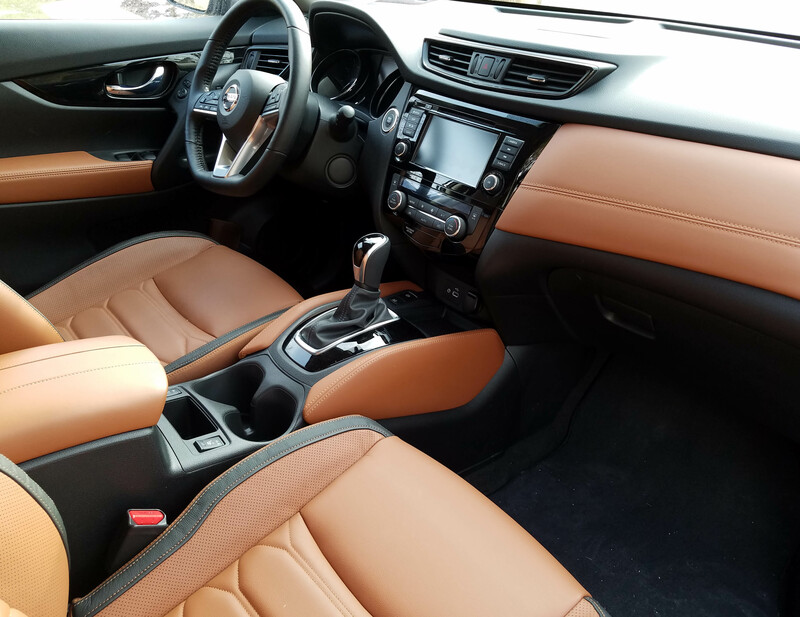 Inside is where the Rogue’s comfort and advantages tend to shine. The blue test ute had saddle brown leather seats with dark brown trim, a dark brown dash and saddle brown dash facing. The headliner was oatmeal colored and there was gloss black trim on the center stack, around the shifter and on the doors. Seats are soft and comfortable with good side and back support, but not overly tight making them easy to slide into and out of. The driver’s seat is powered too, including a lumbar support. Head and legroom is good front and rear and the rear seat will slide to increase space. That seat also reclines. There’s ample cargo space behind the rear seat too while the rear seat backs folds down in a 40/20/40 split to increase useable cargo space. This one included a Platinum Reserve interior that gave it the tan color and quilted inserts that made these look and feel just a touch better than what is standard. It’s a worthy add-on. I also liked the panoramic sunroof overhead. That’s part of the $1,820 Premium package that also adds LED headlights. Standard though on the SL are a 2-memory driver’s seat, heated steering wheel (doesn’t get very warm though) and heated front seats, plus a flat-bottomed steering wheel that not only looks sporty, but provides the driver a bit more legroom when entering and exiting the vehicle. All the safety features come on SL too, plus a motion-activated power hatch and a snazzy Bose premium sound system. Another worthy upgrade on the SL is its 7-inch infotainment screen. A 5-incher is standard on the S and SV models. That’s small. Also standard is push-button starts, a manual tilt/telescope steering wheel along with all the Intelligent cruise control and trip computer buttons on its hub. Everything was easy to figure out and use. 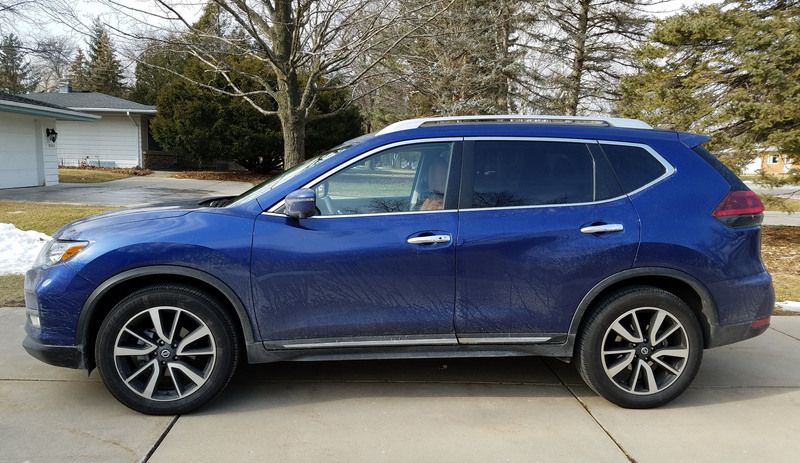 Under the stack are electronic hookups too and both Apple CarPlay and Android Auto are standard with NissanConnect, which includes a navigation system. Overhead is a HomeLink system and an SOS emergency help button too. Gas mileage was good with the Rogue. I managed 26.2 miles per gallon in about 70% highway driving. The EPA rates this at 25 mpg city and 32 highway, probably more likely in less chilly, slippery weather. The tested SL starts at $33,385, including delivery, and with options the test ute hit $36,520. That’s easily in the midst of the small crossover/ute market, making this attractive to families on a budget. A front-drive SL model lists at $32,155, including the destination charge. 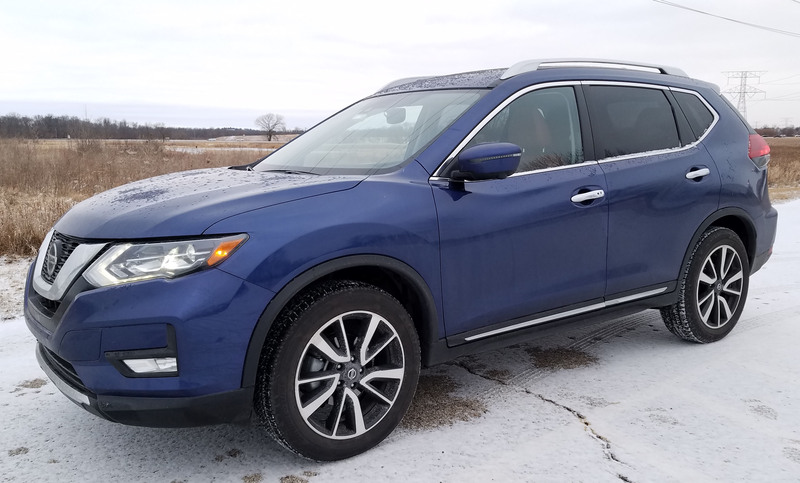 For more economy minded buyers the S with front-wheel-drive starts at $25,775 including delivery and moving up to AWD moves the price to $27,125. The mid-level SV starts at $26,995 for front drive and $28,348 for AWD and adds the power driver’s seat, heated front seats and mirrors, roof rails, dual zone climate system and privacy glass. This is likely the best buy. Value and comfort keep Rogue among the popular options in the small ute/crossover market, which is one of the most competitive segments these days. 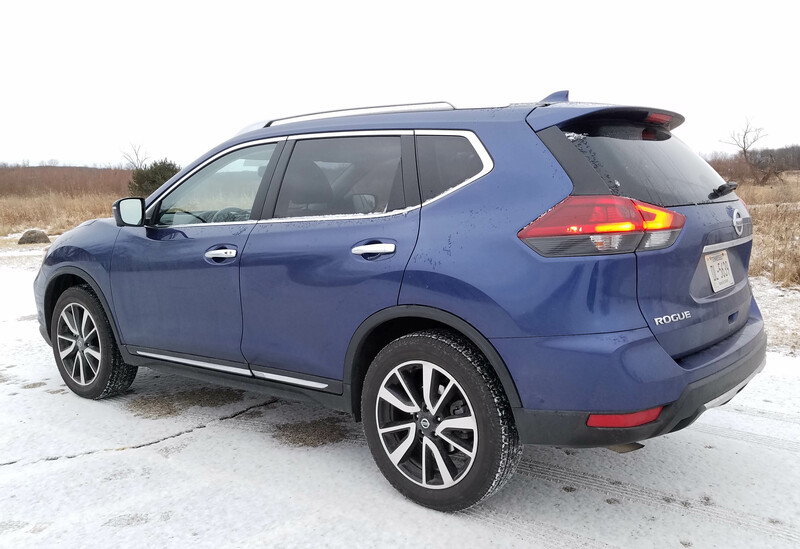 Hits: Roomy, comfortable small SUV with giant sunroof, 2-memory driver’s seat, heated steering wheel and heated front seats. Plus flat-bottomed steering wheel, power hatch, and full complement of safety devices. Misses: Modest power, bumpy ride, blah steering feedback. ProPilot Assist partially works in city, better on highway. Heated wheel never gets very warm. Made in: Los Angeles, Calif.